I have decided to mix it up a little for this review. I believe my review setup is fine but I haven’t been keen on the pictures I have been using. The above writing test is the bio of Max Miedinger who helped create Helvetica. By writing less, this will allow me to take a more detailed/closer picture of the ink that each pen will produce. It also means I can take a more detailed picture of the pen. The Schneider Slider Edge XB can be purchase for around £1.51 and comes in a wide range of colours - Black, Blue, Red, Green, Orange, Violet, Pink, Light blue and Light Green (I wasn’t joking about the wide range of colours!) 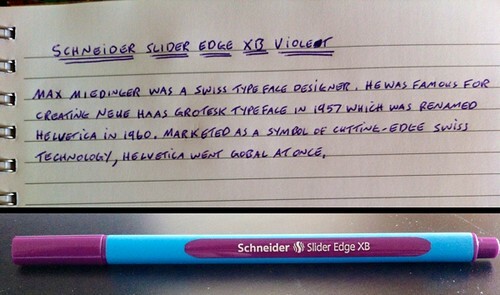 The Schneider Slider Edge also comes in F, M and XB line sizes. The design of this pen is unique as it has a triangle shaped barrel. This makes it comfortable to hold and reminds me of a pen I used in school when I was learning to write. The barrel is covered in a soft plastic material that acts as the grip for the pen. While using this pen, I found this grip material did not work at all for the way I gripped a pen, I constantly had to re-align my hand to grip the pen again whilst writing. I found the ink follow and quality of the colours to be really impressive. While searching via cultpens website, I found that the Schneider Slider Edge uses ink that is similar to the Jetstream 101 which means you get all the wonderful ink properties. Overall I am unsure how I feel about the Schneider Slider Edge as I think the way I grip it means we don’t fit together well. On the other hand my wife loves this pen and uses it a lot, she hasn’t had the same grip issues I have had. Good all round pen. I would like to take this time to thank the wonderful people over at cultpens for sponsoring me for the month of November. It has been a pleasure to review all the pens this month and if you are looking for something new, why not head on over!